Recently we ran a routine XRD measurement. The ID test showed that the identity of the crystal form was “as expected” and formally complied to specifications. Thus, overall the crystal form had not changed. 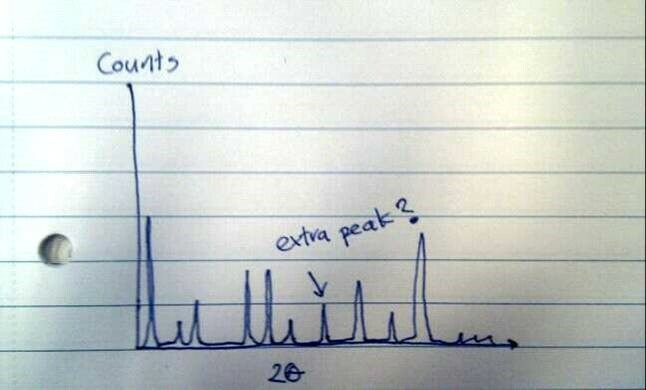 However, three additional peaks were observed on the diffractogram. Should we care? People working with XRD know that special particle/crystal characteristics can give rise to extra peaks because of preferential orientation. Thus it is tempting to conclude that these extra peaks are caused by this orientation aspect and do nothing further about the issue. However, a potential risk exists that it is caused by “something else”, for instance, the existence of a new polymorphic form in the sample – or another crystalline impurity. With regard to the regulatory guideline you do not have to examine the origin of these peaks further: The identification test was fine. However, to be sure that you are not about to find a new polymorphic form, that might cause very large problems in later development, the system should be further explored. In the current case it turned out to be caused by an impurity without impact on the general crystallinity! However, the result highlighted that XRD should not be used for quantitative analysis unless the method has been validated for this purpose (e.g using an internal standard).